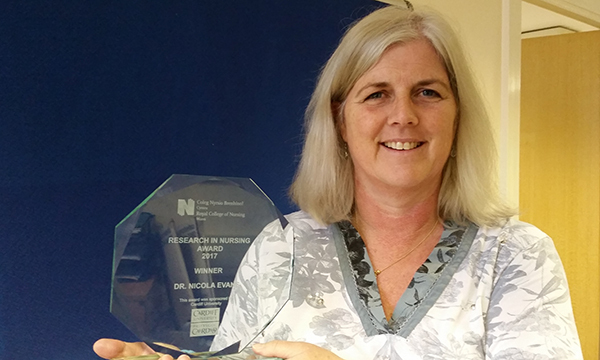 Senior lecturer Nicola Evans, on how taking all opportunities can provide the best outcomes for your career, and how winning the RCN Wales Research in Nursing award broadened the horizons for child and adolescent mental health services. I ‘fell’ into nursing during my early twenties. I wanted to develop a people-focused career in an area where I thought I could make a difference to people’s lives. Looking back, I was naive and had no idea about mental healthcare, but like many young adults I was full of ideas and optimism. What’s the main focus of your current role? Part of my role is working with student mental health nurses during their undergraduate programme. I also support postgraduate students on programmes and supervise the studies of a small number of doctoral students. I have become involved in a few research projects looking at aspects of care in child and adolescent mental health services (CAMHS). This is a particular area of interest for me, having previously worked in a clinical role in the field and completed my doctorate in CAMHS. The absolute benchmark of any good or useful piece of work is evidence of its impact on people who use services. Even a small contribution that positively effects a young person and their family is a success. From a research perspective, there can be a time delay between research projects being completed and the new knowledge being implemented in practice. But as my doctoral study used action research as the methodology, immediate change and improvement was evident, making it feel worthwhile. Juggling deadlines, priorities and fitting everything into limited time, as it is for many colleagues across clinical practice, research and education. I also like to try to keep a healthy work-life balance, but I don’t always get that right. What exemplifies the best CAMHS? I am continually reminded that what matters to children, young people and their families is to be listened to properly; to be consulted, work in partnership and to be shown kindness. Of course, evidence-based practice is our gold standard, but the best services, and in my view the best nursing contribution in CAMHS, bring all of this together. What one thing would improve child and adolescent mental health work? Although CAMHS is excellent, it is not necessarily needed to support all young people with mental health concerns. I have seen excellent work done by teachers, third-sector workers, GPs, school nurses, parents and friends. If there were a way to take forward children’s mental health as a public health issue in a stronger, more focused way; perhaps prevention, detection and early intervention work would become more coordinated and streamlined. Then specialist CAMHS would be able to focus on providing specialist-only services. I try to help people find achievable goals, so they do what they would like to be doing rather than what they think they ought to. Sometimes I think we just need an opportunity to try something out to see if it is for us, and I encourage people to take these small risks. For example, working in an area previously unfamiliar to them, or applying for an award, grant or travel fellowship, with fingers crossed. We should notice and celebrate small successes in ourselves and others. What difference will the RCN Research in Nursing award make to your work? Since winning the award, I have attracted additional attention, particularly on social media, which all helps to highlight the critically important field of nursing in children and young people’s mental health. We can make a real difference to children and young people. Research in this area allows us to think carefully about which aspects of services are useful and effective, what we should do more of and what we should change. The award acknowledges the importance of this work and will help promote it as a priority.